This post is a super simple how-to that results in the best teacher gift - thoughtful, simple, handmade. It is potentially so simple I am not sure it is worth a basic how-to but for those of you looking for ideas maybe this will tickle your fancy. It can be done in an evening or two after school and your 5+ child will be capable of making it almost completely solo. But before we begin I wanted to share the amazing thing that happened to us today while making the aforementioned gift. So this year I found a way for the smalls to design, create and own their gift for their teacher completely and thought we should share. a pile of felt - preferably wool felt. a fabric marker - my favourite is the blue Clover water erasable one. some embroidery thread - preferably Perle 12 or Perle 8. Step 2. Using a fabric marker get your small to draw something on their felt. We chose the first letters of their teacher's name. Step 3. Embroider over the drawing on the felt. 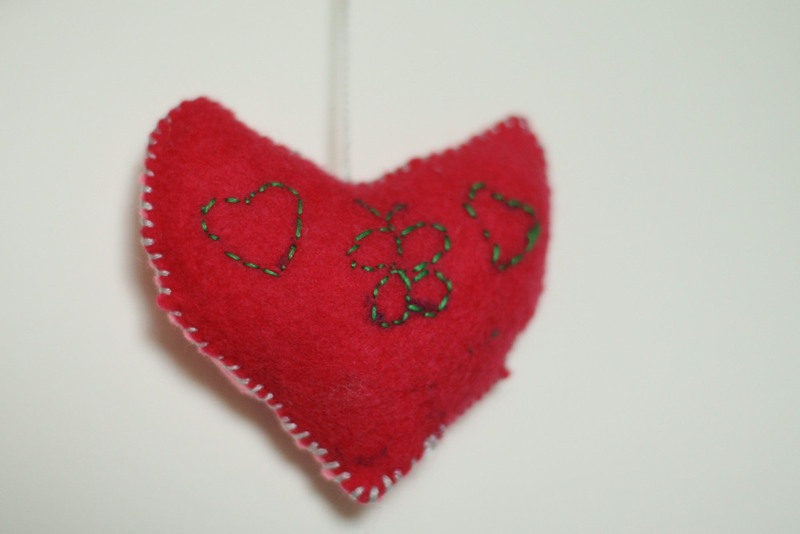 A running stitch is probably better for the smaller ones. My 5yo and 7yo are both now capable of a beautiful backstitch. Step 4. 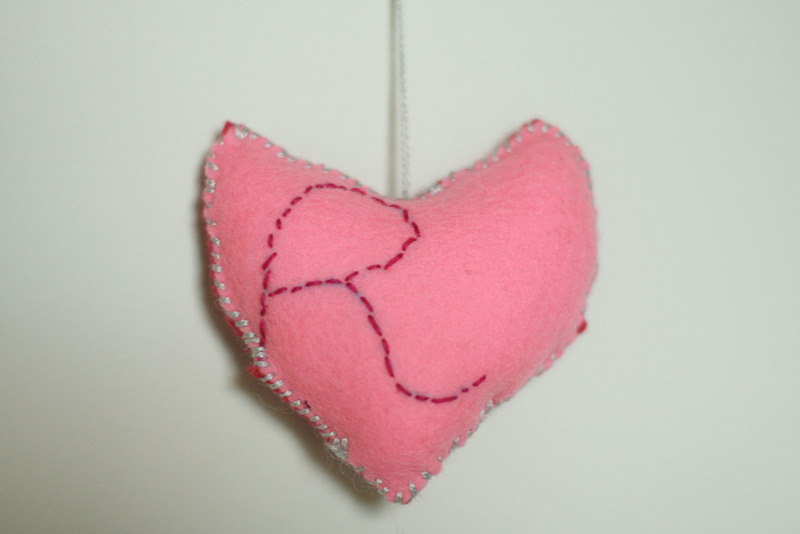 Sew the shapes together using either a whip stitch or the sewing machine leaving an inch size gap. 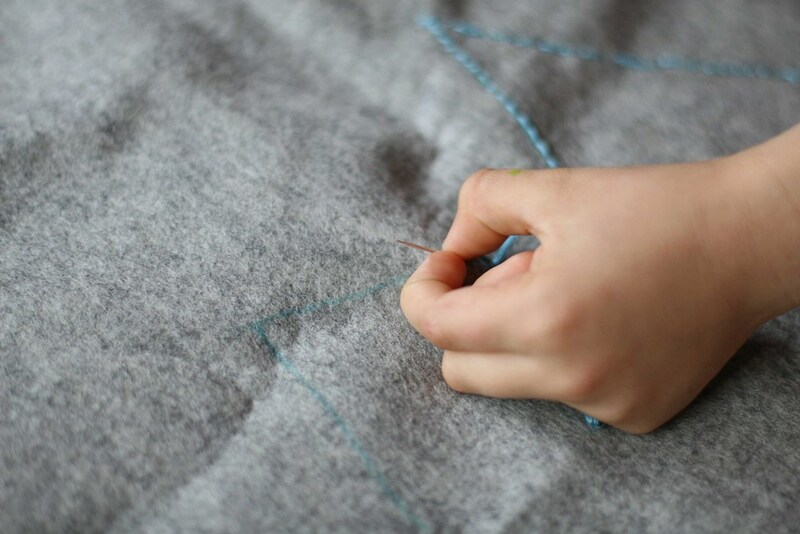 Sewing the shapes together on the slightly larger version of this project - details towards the bottom of the post. Step 5. Stuff the shape. Step 6. Sew up the gap. Step 7. 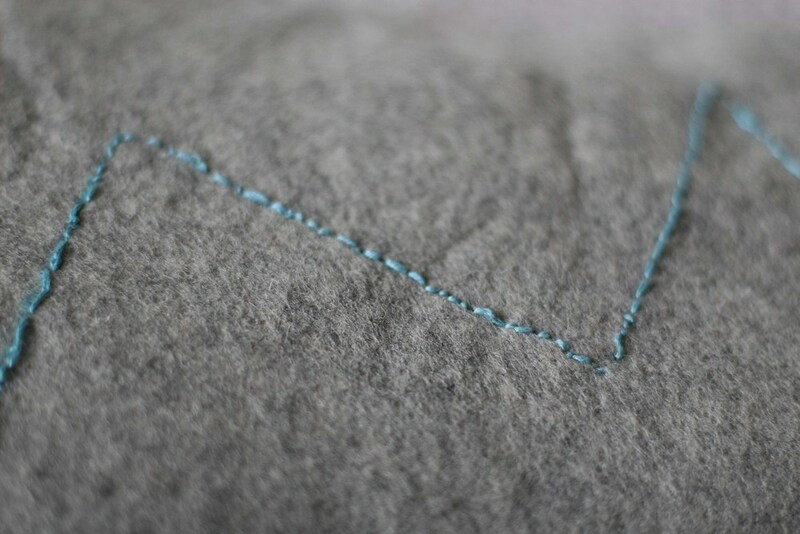 Make a long loop of embroidery thread (or maybe a ribbon if you are feeling a little fancy) and attach it to the ornament. So a simple project where they can own the whole design and the making. It didn't quite go to plan for me.....almost, but not quite. My 5yo girl chose some felt in her teachers favourite colours ("It's easy mum because she likes sooo many colours") and some thread and got to work. 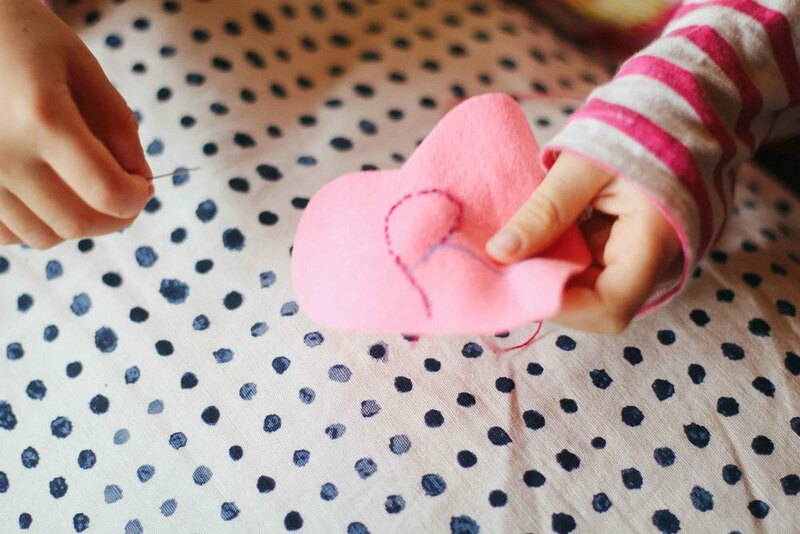 Watching her little hands pull the thread through the felt so capably and confidently just made my heart sing. I actually got a little teary at one point - sshhh! She did her teachers initial on one side and then on the back she wanted me to draw some butterflies and hearts. And then off she went - concentrating hard, one stitch at a time. Look at the little hand. My boy child is one who has big ideas and I did have a moment today when I had to physically take a breath to ensure that I relinquished control over the project, and my materials, to let him go with his idea. He wanted to do something BIG. "An ornament isn't big enough mum. I want to make him a cloth". "With a massive piece of my wool felt that I have purchased for something else" I thought silently biting my tongue. I then asked out loud "What will he do with the cloth mate?". "I dunno mum...he can just use it as a cloth..."
Hmmm.... "What about we make it into a cushion?" I was then seen as a champion facilitator of big ideas. Win win. And I can always buy more felt. Anyway the point of the exercise was to get a present for their teachers (check) where they had put effort into thinking about what someone else would like (check) that they made with their own hands (check) and to their own design (check). I love love the joy and pride they get out of doing something like this. I remember the feeling from when I was a small person and my mum was the facilitator. 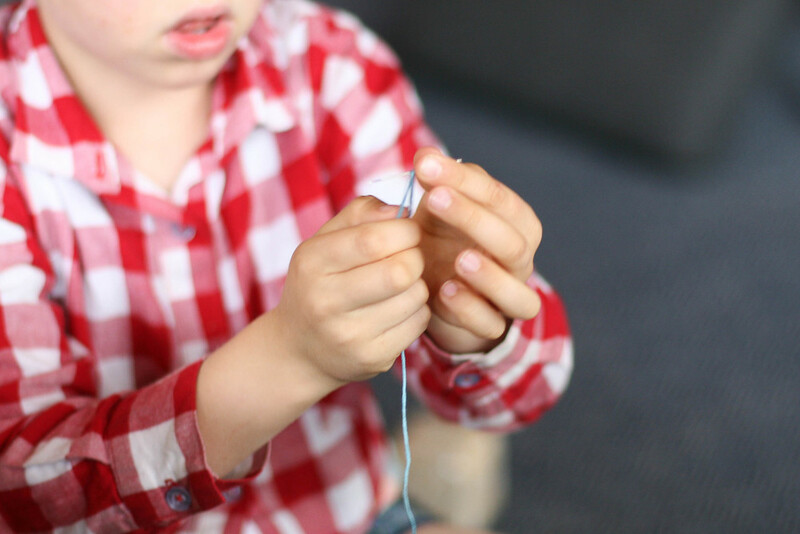 For those of you who think your kids might like to try some stitching but aren't sure where to start - mine started doing embroidery or making softies with felt when they were around three. 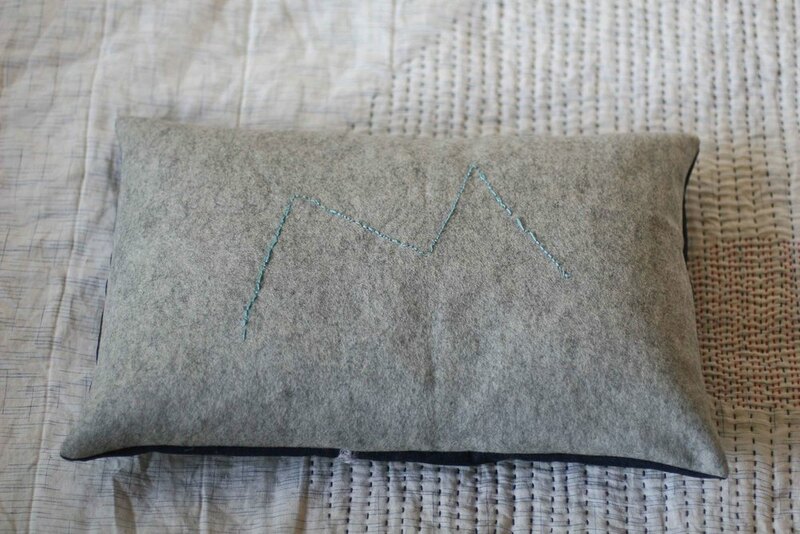 Felt is an awesome starter project because unlike embroidery on fabric, as long as you use good wool felt, then it has enough stiffness that they can embroider without a hoop. 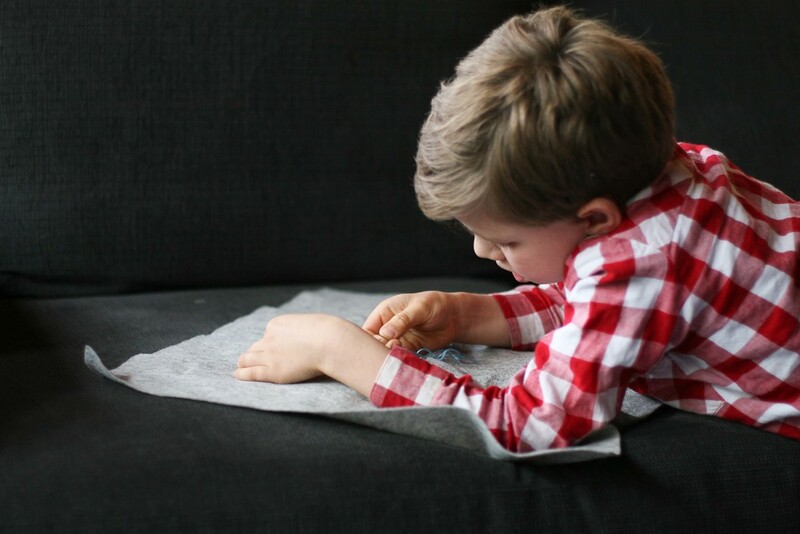 This gives them more freedom to be able to manipulate the fabric which in turn makes it easier to embroider and sew. Starting out they just used a simple whip stitch and went round and round whatever interesting shape they cut out and then we stuck some stuffing in it and finished the hole. Project complete and happy small people. If possible I would always use wool felt as it feels nicer as the needle is going through, as well as being stiffer, so easier to sew. They are very happy with scraps. I would also use a Perle 8 cotton as it is thick and easier for them to thread than something with lots of plies like embroidery thread. I'd love to hear what you made? Any other ideas for simple teacher gifts?